Donald Trump and his South Korean counterpart Moon Jae-in must face North Korea’s nuclear reality: Pyongyang’s bomb is here to stay. When the two presidents hold their first summit on Friday, they need to drop quixotic efforts to stop Kim Jong Un from building a nuclear arsenal and instead focus on preventing its use. Trump must accept the evidence that sanctions and military shows of force do not move the North. Moon must accept that a “sunshine” policy of economic and political outreach will not coax Pyongyang from its nuclear tether as long as Kim Jong Un equates the arsenal with survival. Washington also should take military action off the table unless the crisis is so acute that no other option remains. 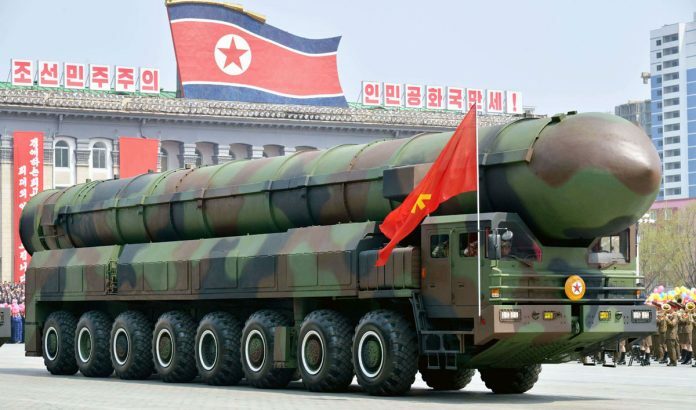 North Korea has advanced its nuclear program too far and concealed too much to allow Israeli-style air strikes like those that eliminated the Iraqi and Syrian nuclear reactors in 1981 and 2007. The mayhem that would result from any U.S. military invasion to find and destroy Pyongyang’s bombs would envelop most of the Korean peninsula and could leave in its wake hundreds of thousands of dead South Koreans. Fortunately, the history of the nuclear age suggests an alternative. Containment. Containment is hard work. To succeed, it needs three elements. One is deterrence. When tensions rose between nuclear powers like the United States and the Soviet Union or India and Pakistan, the risk of nuclear armageddon proved to be an overwhelming impediment to pushing the button. The lesson for the Korean peninsula is that the United States should return to South Korea the nuclear weapons Washington withdrew in 1991, but if that’s implausible politically, declare a firm policy – backed by dedicated offshore nuclear forces – that the United States will eliminate the North if it uses nukes or makes a serious nuclear threat. The second is adopting Cold War-era confidence building measures to further reduce the risk of war. The measures could take the form of adding the United States to a resurrected North-South hotline – permitting instant communication between the Koreas and Washington. U.S. and North Korean liaison offices in Washington and Pyongyang would be even better. Verifiable reductions of troops and heavy weapons on both sides of the border would reduce concerns about surprise attack, as would reductions of large U.S.-South Korean military exercises and North Korea military displays. The list can go in many directions. The United States could begin the exploratory process of tapping Pyongyang’s interest through China or other third parties. The third is crisis management. It is hard to determine whether a North Korea with the bomb will be more or less prone to initiate incidents like the sinking of a South Korean navy ship to embarrass or intimidate Seoul. In the event a spark sets off serious tensions, it will be critical to stop escalation. Unlike the Cuban missile and 1969 Sino-Soviet cases, when surprise forced the adversaries to scramble for a plan, a crisis on the Korean peninsula should not be unexpected. No doubt Washington and Seoul have military plans in place to respond. But judging from past nuclear crises, the United States may be less prepared diplomatically. Here again Washington can draw lessons from the past. If a crisis appears to be moving out of control, Washington must have a mediator ready to go. The value of U.S. mediation in the Indo-Pakistan crises proved invaluable. When it comes to Kim Jong Un, Washington should consult with Beijing about preparations for China to serve as an intermediary if necessary. Second, Trump and Moon could use private parties as conduits to float possible solutions. During the Cuban missile crisis, the Soviets used a U.S. businessman visiting Moscow and an ABC network correspondent in Washington as back channels. President Kennedy turned to his brother Robert to press Soviet Ambassador Anatoly Dobrynin. In the case of Pyongyang, the United States could enlist former U.S. officials experienced in Track II diplomacy or even unofficially “allow” someone like a former president – as Bill Clinton did with Jimmy Carter during the 1994 Yongbyon nuclear reactor crisis – to reach out to their own North Korean contacts. Third, send a very senior official to the capital of the opponent to seek resolution. That’s what the Kremlin did in 1969 when it sent Premier Alexei Kosygin to Beijing in a last-ditch attempt to head off a possible Sino-Soviet confrontation. It worked. The belief we can make nuclear North Korea go away is a mirage. The time for planning to live with it is upon us. Let’s get on with the task. The belief we can make nuclear North Korea go away is a mirage. How to Stop Kim Jong Un from Using his Nukes? Containment could be one.